Sweden has confirmed it held a second “secret” search operation for a foreign submarine in its waters back in October. The hunt, not reported until now, followed media source claims about a sighting of a submarine tower outside Stockholm. A submarine-hunting corvette, HMS Malmö, was secretly deployed in the waters between Lidingö Island in the inner Stockholm archipelago and Nacka Municipality on October 31, the Dagens Nyheter newspaper reported on Sunday. The newspaper, however, didn’t provide any photos in its report. The Swedish Armed Forces have confirmed the operation took place at the end of October. “The information in Dagens Nyheter is correct,” Philip Simon, head of press for the Swedish Armed Forces told the TT news agency. The search was performed alongside another “official” operation, launched in the Stockholm archipelago even earlier between October 17 and October 24, when troops were engaged in a search for possible “foreign underwater activity.” It is thought to be Sweden’s biggest military operation in the Baltic Sea since the Cold War. “That we opted to investigate further reflects both the credibility of the person who made the sighting and the fact that we had both vessels and ground forces in the vicinity, which meant we could rapidly reach the site. Despite that, we got no result,” he said, thus, backing the report in Dagens Nyheter. According to Simon, there have been more than 400 reports of submarine sightings since October. The Swedish media alleged the operation could be a hunt for a “damaged Russian submarine” in the area. But Moscow has repeatedly denied the accusations. 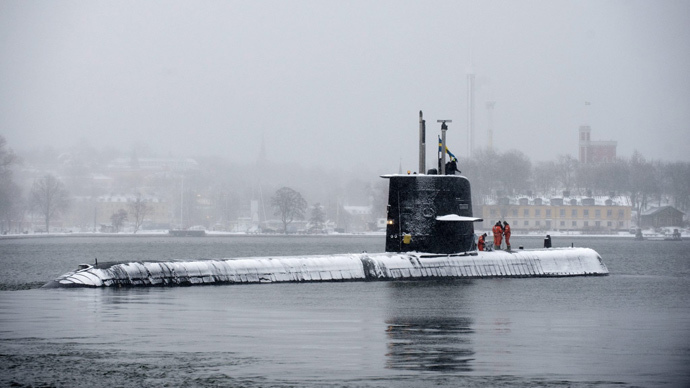 On November 14, Sweden’s Armed Forces confirmed that a foreign submarine entered its waters. However, the military failed to determine which country the intruding vessel came from. The Swedish Navy’s efforts to trace the elusive foreign activity cost the country €2.2 million ($2.8 million). According to the latest draft budget published in the wake of the naval operation, Stockholm plans to increase military spending for 2015 by $93.7 million.